The government website describes Offensive Waste as non-clinical waste that’s non-infectious and doesn’t contain pharmaceutical or chemical substances, but may be unpleasant to anyone who comes into contact with it. Offensive waste is further divided into two types, healthcare offensive waste and municipal offensive waste. Examples of healthcare offensive waste are outer dressings, protective clothing such as masks, gowns or gloves (as long as they aren’t contaminated with body fluids) and sterilised laboratory waste. This type of waste is usually produced in medical clinics and veterinary surgeries. Municipal offensive waste, on the other hand, consists of waste such as hygiene waste and sanitary protection, for example incontinence pads or nappies. There are strict requirements for how offensive waste is stored, labelled, collected and treated. It is important for this type of waste to not only be separated out properly but also to be stored so as to stand out from other waste and be easily identified. Offensive waste disposal bags are also known as tiger stripe bags because of their bright yellow opaque colouring with black vertical stripes. As well as being distinctively coloured, disposal bags for offensive waste also need to be of high quality in order to meet Government regulations. While offensive waste could be disposed of with infectious waste, this is expensive, so separating it out can result in big cost savings. Using tiger stripe bags allows for offensive waste to be disposed of safely and legally without the extra expense associated with disposing of infectious waste. It is important to only use tiger stripe bags for offensive waste and they absolutely must not contain any type of domestic waste, infectious waste, anatomical waste, placental waste or Cytotoxic/Cytostatic waste (Cytotoxic medicines are drugs that have a toxic effect on cells, for example chemotherapy treatments that kill off cancer cells and Cytostatic drugs suppress cell growth, for example some cancer hormone therapies that inhibit the growth of cancer cells). Abbey Polythene can manufacture and supply tiger stripe bags to enable medical or veterinary practices to adhere to Government regulations with regard to their offensive waste. 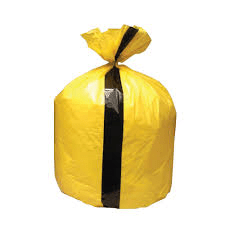 As well as having the distinctive opaque yellow colouring with vertical black stripes, our bags are also made from the highest quality plastic LDPE to keep your staff safe. You can find out more about ordering our tiger striped bags on our website. We also supply clinical waste bags for healthcare and veterinary practices and specialist clinical waste collection companies. Both our tiger stripe bags and clinical waste bags are delivered within two to three days as standard, with speedier delivery options available if required.